Hotlinking (inline linking) is referring to displaying an image on Website B by directly linking to that image from Website A. In this case, we can assume Website A is your website while Website B is an unknown website to you. How Hotlinking Works and How It Affects Me? As a website owner, you may have a number of images on your website. At the same time, someone at an unknown place may feel that they would like to apply the same images (from your website) on their own website. However, instead of saving their own copies on their website, they may insert the images via direct links to yours. This way, they will be using your bandwidth for the images and this will cost you money and loss of bandwidth. This step is pretty straightforward. In this example, we are going to insert Gotcha image which will appear each time when there is a hotlinking to content on our website. If you have some development knowledge you can create an entire page, or configure your website in multiple ways to prevent hotlinking. For convenience, just use one simple image to configure the hotlinking protection on your Joomla installation. Kindly note to save your image with an .jpe extension. 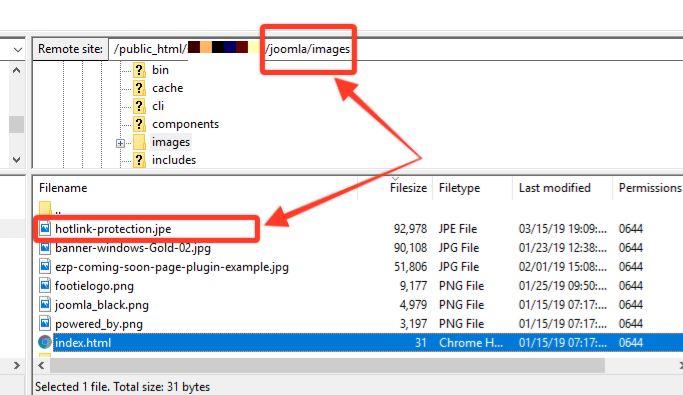 Remember, the hotlink image file should be placed inside /joomla/images folder. After you locate the directory of your Joomla website, you need to go the .htaccess file and download it on your personal computer. From there, you can edit it with a simple text editor, such as Notepad. NOTE: Where example.com is your actual domain name and you need to change that accordingly. What this rule does is to allow the use of the images on your website, however, all requests from other websites for the specified extension types will be redirected to the hotlink-protection.jpe image that you have created in Step 1.